It’s after Memorial day, the Nuni has finished first grade (!) and summer vacation is in full swing around these parts. I am kicking off the summer by breaking my pinky toe and going slowly insane because my children are whining. You? I don’t know about you, but our zucchini plant is growing like crazy. 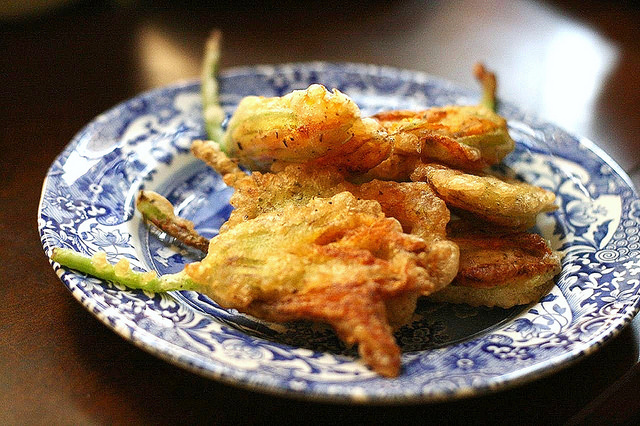 Instead of drowning under a bushel of zucchini come July, pick them while they’re tiny and make these fried zucchini blossoms. I bought two pairs of these shoes and they are super cute and super comfortable. Yes, they are made of pleather, and yes, they will probably fall to pieces after about 3 months but for $23, what do you expect? Red shoes! I don’t know if you’ve been following the #YesAllWomen movement, but in the wake of the Isla Vista shooting and the misogynistic hate screed that accompanied it, women are stepping forward to tell their stories. It’s both depressing (so much to be done!) and inspiring (women having a voice!) It’s worth checking out the feed, and if you have something to add, posting. My friend Rachel Cedar runs a very successful parenting consulting business in New York. In February, she ran a great series with a bunch of talented writers on playing with your kids, called 28 Days of Play. With the long days of summer vacation looming, the series is worth revisiting. (Rachel is also a go-to for very sage parenting advice, so check out the rest of her blog, too).